When Mumbai was brutally attacked by terrorists, not only India was aghast, but the entire world stood in disbelief. With this horrific act of terrorism, Pakistan’s Jihadi groups convinced the world how far they have reached as destructive forces. In the light of these happenings, Ganesha gives a more clear astrological view on Pakistan’s tryst with terrorism and analyzes why this nation is blamed for aiding terrorists. Pluto signifies terrorism and organized terrorism. Notice that Pluto is placed in the fourth house of Pakistan’s chart. The fourth house determines and signifies the emotions and things at heart. Secondly notice that Rahu is in the ascendant of Pakistan, just like India, but the difference is that Rahu is applying to Pakistan’s ascendant degrees and is separating India’s ascendant degrees, this has made the major difference. This is rather the first and foremost thing which makes Pakistan seem to be favouring terrorism and militancy. Actually the separative and malefic forces of Rahu have been instrumental in Pakistan following dictatorship and military rule as well as separatist and pessimistic disciplines. Notice how Pluto, Saturn and Sukra are in applying square aspect to Pakistan’s ascendant. Square aspects as well as know from Ganesha’s previous articles are drivers of life and events. Square aspects make the event happen, make you active, make you act. 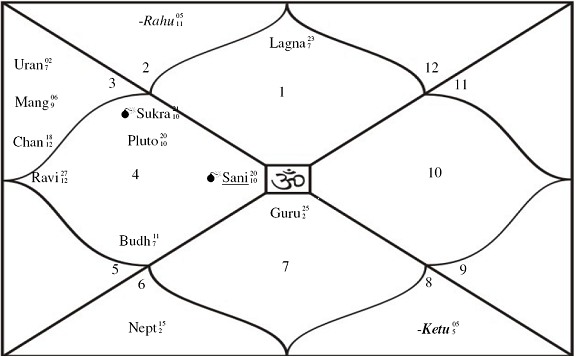 Notice that Sukra and Shani are not positive planets for Pakistan, as per its Mesha Lagna. Thus with a strong stellium of these three malefic planets square to the ascendant help Pakistan create an impression to be a state supporting terrorism and separative groups and people. Rahu included in this reading, amplifies the whole issue and rather specifies that Pakistan’s leadership too usually gets into this mode, despite the leader having good ambitions, thoughts and ideas. Adding to this, Mars as well as know, the ascendant lord of Pakistan signifies militancy, rash and aggressive nature, don’t care attitude. This mars is semi square the ascendant degrees, again putting Pakistan into an active mode of supporting terrorism. Notice how destined Pakistan is in these matters, with Ketu inconjunct Mars again an action forming aspect. So with such hard aspects involving militant planets in Pakistan’s horoscope, it always in the centre stage with regards to states supporting terrorism. Will this stop? And When? Well all things stop and change, is the dictum of nature and world. So, being fully optimistic of this, lest see, when Pakistan’s such impression will cease. The distance between Pluto and Ascendant is about 87 degrees. The distance between Pluto and Rahu is about 75 degrees. The distance between Mars and Ketu is 149 degrees. In this light the major age till when Pakistan may be heavily influenced by separatist policies is till 149 year, but half of it is at 75 years, which is near the Pluto-Rahu distance. Ganesha thus feels that there will be a major influence of this separatist policy on the world between the age of 72 and 75 and matters will start receding after that, till Pakistan reaches the age 87, the Pluto-Asc distance, but once Pakistan crosses this age, it will seem to be less involved in such anti-peace activities, in the eyes of the world. It has come to Ganesha’s notice that there is probably a war pending or impending, involving Pakistan with any other nations between the age of 72 and 75, which means in the years 2019 to 2022. Nations politically not inclined towards Pakistan may need to be careful. Using Solar Arc progression the exact years are from 14th August 2020 to 14th August 2023 for the war and/or a major terrorist activity blame, after which it will slowly seem to be backing off from such unhealthy policies. Once it crosses the age of 87, which seems to be 14th August 2032, it will mostly not be blamed for supporting terrorism.